A young tagged hen harrier has disappeared in Aberdeenshire in what RSPB Scotland described as "highly suspicious" circumstances. Calluna, a female harrier, was fitted with a satellite tag earlier this year at a nest on the National Trust for Scotland's Mar Lodge Estate near Braemar. It was part of RSPB Scotland's Hen Harrier LIFE project. Calluna's last recorded position was on a grouse moor north of Ballater. Scottish Land and Estates said local land managers rejected any suggestion the loss of signal from the tag was connected to grouse moor management. The transmitter's data was being monitored, and showed that the bird fledged from the nest in July. She left the area in early August, with the data showing her gradually heading east over the Deeside moors. However, transmissions ended on 12 August. Ian Thomson, head of investigations at RSPB Scotland, said: "This bird joins the lengthening list of satellite-tagged birds of prey that have disappeared, in highly suspicious circumstances, almost exclusively in areas intensively managed for grouse shooting. 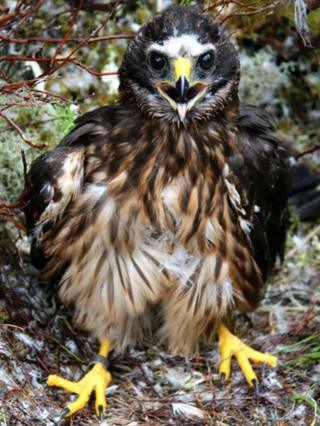 "The LIFE project team has fitted a significant number of tags to young hen harriers this year, with the very welcome help from landowners, including the National Trust for Scotland, who value these magnificent birds breeding on their property. "The transmitters used in this project are incredibly reliable and the sudden halt in data being received from it, with no hint of a malfunction, is very concerning. "We ask that if anyone has any information about the disappearance of this bird we urge them to contact Police Scotland as quickly as possible." David Frew, operations manager for the National Trust for Scotland at Mar Lodge Estate, said: "It is deeply saddening to learn that Calluna appears to have been lost, so soon after fledging from Mar Lodge Estate. "Hen harriers were persecuted on Deeside for a great many years, and we had hoped that the first successful breeding attempt on Mar Lodge Estate in 2016 would signal the start of a recovery for these magnificent birds in the area. "Only one month after fledging, and having travelled only a relatively short distance, it appears that we will no longer be able to follow the progress of our 2017 chick. "We hope however that the data her tag has provided will help to inform a wider understanding of the lives and threats faced by hen harriers." A spokesman for The Scottish Gamekeepers Association (SGA) said: "The SGA would urge anyone who saw the bird or knows anything about it to contact Police Scotland. "This is the first we have heard of this. Obviously any news like this is very disappointing. "The SGA condemns raptor persecution and if any of our members are convicted of a wildlife crime they are removed from our organisation. "We have learned from those monitoring tags that birds can move some distance away from where they were last recorded so it is important that, if people know anything, they alert the police immediately." David Johnstone, chairman of Scottish Land and Estates, said: "Estates in the area have welcomed a number of hen harriers to the area during August and only today one moor reported three harriers. "Local land managers reject the inference that the loss of signal from this tag is connected to grouse moor management and are now offering every assistance in searching the area where the last transmission was recorded." Susan Davies, director of conservation at the Scottish Wildlife Trust (SWT) said: "It's extremely disappointing to learn that yet another hen harrier has disappeared over a grouse moor. "The most recent surveys show that hen harrier numbers are declining in most parts of Scotland and that illegal persecution is a factor in this decline." A recent survey showed that in the past 12 years, the number of breeding pairs of hen harriers had fallen by more than a quarter (27%) in Scotland and by over a third (39%) in the UK as a whole. Scotland remains a stronghold for the birds, with 80% of the UK population. Current estimates suggest there are about 600 breeding pairs across the UK.